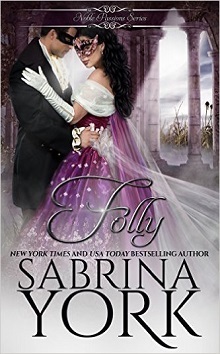 Wrapping up (for now) the steamy Regency romance series, Noble Passions by Sabrina York is today’s title. Newly recovered and re-released – you’ll want to grab this series for your own library. I’ve been back and forth on this story – widowed and in dire circumstances, Eleanor wants to outwit her in laws and provide a sort of life for herself, even if in the clutches of the Dowager. With a horrid marriage behind her, and no heir to save her position, she’s reduced to plotting a means to an end. A masquerade ball full of lascivious acts and anonymity, she’s decided to seduce a random man – any random man, with the intention of becoming pregnant and securing her place. What she never expected was the passion and connection she made with the man under the domino, in the secluded Folly on the great house’s grounds. Ethan Pennington has spent the past years in seclusion, rarely leaving his estates after a swordfight went amiss. The tempting morsel at the party is intriguing, and he cannot help but be enchanted with her reactions and her need. Imagine his surprise when, called to spend time at his best friend’s house for an extended party he comes face to face with a lovely small woman, one that his body can’t deny. Back and forth Eleanor and Ethan tentatively explore the connection while Eleanor’s friend and host, Helena, is determined to find her a new husband. When Eleanor finally comes clean and explains the plan to secure her place to Ethan, they both learn of the dastardly behaviors that Ulster, Eleanor’s dead husband, wrought on the two of them. With plenty of interference from house guests and the new heir to the Ulster title, who mistakenly believes he is entitled to his late cousin’s widow, as well as some near-discovery moments, the story stays tense throughout. Can Ethan give up the determination to exact revenge, and can Eleanor ever truly believe that a future (beyond fathering a child) is possible. York again uses wit, heat and clever heroines who aren’t afraid to take the reins to guide their own lives to tell their story. 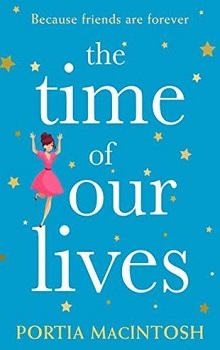 A wonderful wrap up to this clever historic series that uses the connections of a small group of friends and schoolmates as they find their happy endings. This book was originally published in 2012 and has been re-edited, re-covered and re-published. <3 thank you so much for sharing the series! you are so welcome — I’m so happy to see them back and recovered and available!